Established 1808, no longer remaining. One of the oldest in the United States, this asylum started out in the cellar of the north wing of New York Hospital, which was a general hospital. It got its own building in 1808, the New York Lunatic Asylum, which was renamed as the Bloomingdale Asylum in 1821. The modern descendent of this asylum is the Westchester division of the New York Hospital in White Plains: the asylum moved there in 1894. 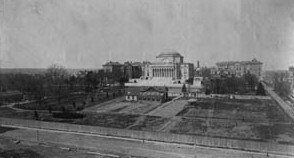 Columbia University now occupies the former site. A guidebook proclaimed of the site (when it was still an asylum): "it occupies a most beautiful and commanding site...the central building is always open to visitors and the view from the top of it, being the most extensive and beautiful of any in the vicinity of the city, is well worthy of attention." 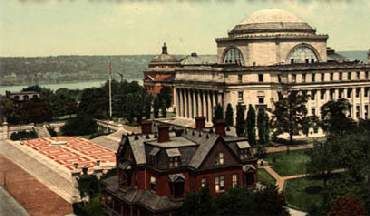 Buell Hall of Columbia University is the only asylum building remaining. This striking building with its stained glass windows was the Asylum's administration building, and is the oldest building on the college campus. The photo to the right shows the asylum's remaining house-like Buell Hall in the foreground, with the university's Low Library looming up behind it The library was constructed the year after the Asylum left the grounds. Click here for another historic photo of Low Library with remaining Asylum buildings nearby.